The invention of the codex created the Bible. In Greek, ta Biblia can mean either “the books" (neuter plural) or "the book" (feminine singular). When the books of the Bible were available on separate scrolls, it was easy to see them as separate free-standing works, “the books”, which could be subject to a mix and match approach of acceptance and rejection. But when they were kept within a single text between two covers, then it was clearly The Book, one book, a concept that gave a mighty boost to the notion of canonizing certain texts and excluding others. The codex was, in its origins, a highly theological invention. 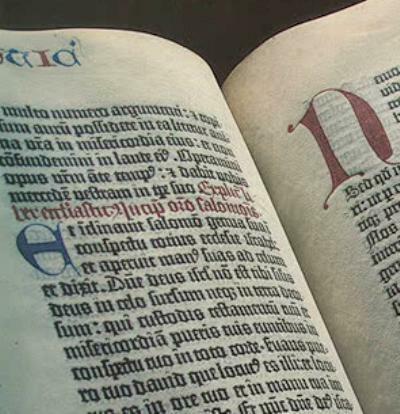 As Jacobs suggests, one primary goal of the new medium was to include both Old and New Testaments within one cover, to stress the harmony and continuity of the texts, and to refute heretics like the Marcionites who set the two at odds. As anyone could see or feel, clearly the two Testaments were one. This allowed and encouraged the quest for parallels and resonances between the two, the ancient quest for typology that so shaped Christian art through the centuries. To return to the Reformation, in no respect were Protestants more radical than in the dominant forms of media used to teach and discuss religious truths, with all that shift implies for cultural sensibilities. As has often been remarked, the Reformation was a media revolution. Traditional societies had taught their truths through visual imagery, such as stained glass and sculpture; through music; and above all, through drama and ritual action, which often involved a large amount of communal participation. Protestants taught through the word, in the form of books and tracts, hymns and sermons. God became Word.